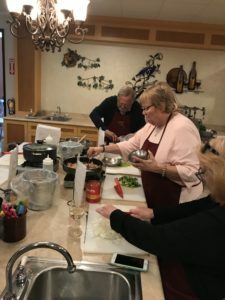 Coming together to prepare a meal is a great way to bond a group, whether it be a family, friends, a birthday celebrations, a bridal event, a club, or a group of workers at a corporation for team building. 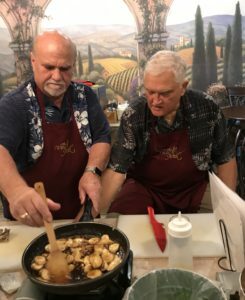 The Wine Artist in Lake Forest, California, is the premiere private event venue and the perfect place to enjoy the camaraderie of a cooking event. The location of being between San Diego and Los Angeles allows companies who have regional meetings to have a place close to both large metropolitan areas. 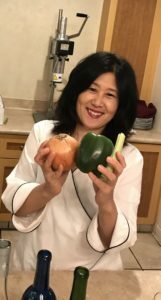 Owner, MJ Hong, offers a variety of menus and ideas on how to host an event. IFWTWA (International Food, Wine & Travel Writers Association) held their regional meeting at The Wine Artist, a place that we have enjoyed in the past. Our anticipation of what we would get to prepare was answered when we arrived with a nod to New Orleans cuisine. 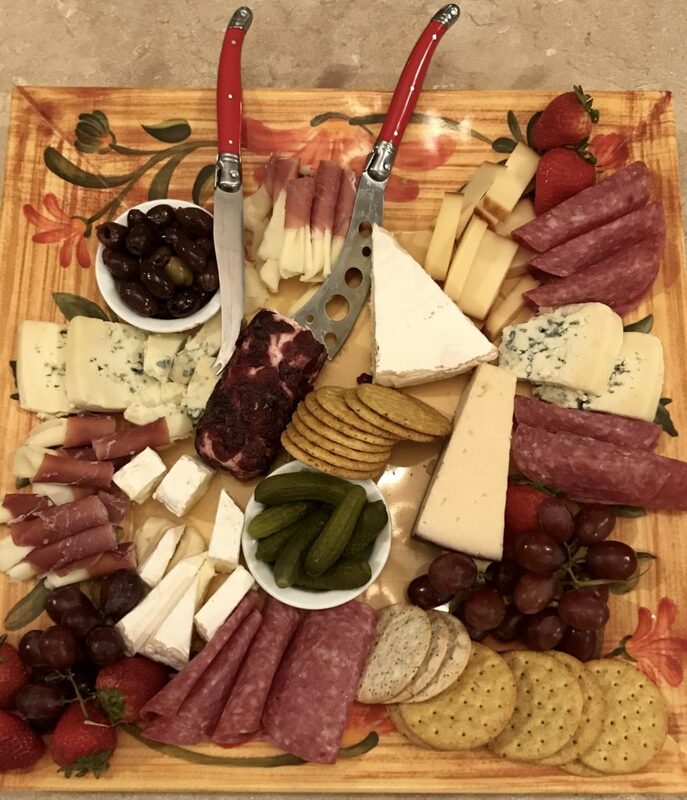 A beautiful charcuterie awaited us along with a couple of bottles of wine while we held our annual regional meeting with Linda Kissam, President, leading the group. After our brief meeting, we were ready to engage in the food preparation that we had been eagerly anticipating. What’s the difference in Cajun and Creole food? MJ explained to us that Cajun originated from Acadia (the Acadian region of Canada) and is considered more “country food” whereas Creole originated from French, Italian, Spanish, and other cultures in New Orleans and considered “city food.” One of the easiest ways to distinguish the two is that Cajun food doesn’t use tomatoes as the base and Creole does. Both Cajun and Creole use the “Holy Trinity” of cooking ingredients comprised of bell pepper, onion, and celery in their dishes. Armed with this information, we were ready to make some great food. First on our list of preparation was making stock which is not broth. Stock is made with bones, and meat, if you like; broth is made with meat, no bones. 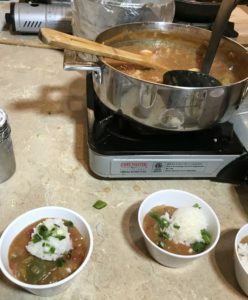 We made stock for the Shrimp Etouffee. In the pot went carrots, parsley, celery and onion along with the shrimp peels and some water. We were told there is no need to peel the onion, carrot, or garlic (if we were using it) for the stock. The peels actually add more flavor. Once the stock has been made, it can be frozen to use at a later time. However, we were going to be using the stock for the Shrimp Etouffee. While the stock was under preparation, the first step of the Beignet began with preparing the dough and letting it rise for about an hour. Half of our group chopped the sausage, bacon, celery, bell pepper, garlic, and chicken for the Jambalaya. The other half busily chopped bell pepper, celery, garlic, and onion for the Shrimp Etouffee while a couple carefully and slowly cooked the roux for the base of the Shrimp Etouffee. The color we were looking for in the etouffee was a golden brown, similar to peanut butter. The aromas wafting from both sides of the cooking station awakened our taste buds in eager anticipation. After all the ingredients were married in both main dishes, it was time to finish our desserts, Bananas Foster and Beignets. Again, half of the group combined the butter, sugar, and cinnamon in a skillet. What a great aroma floated from that pan. The other half heated the oil in a deep pan and rolled out the dough to make squares to be fried. Although the Bananas Foster and Beignets are delicious by themselves, MJ urged us to dip the powdered Beignet in the Bananas Foster sauce. Truly heavenly was our conclusion. MJ is such a great coach in the kitchen and extremely well prepared. 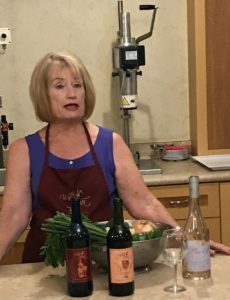 All items to be used are located on a rack close to the countertop, and recipes await all the cooks as she confidently and carefully guides guests through the cooking procedure. A little wine on the side doesn’t hurt in the preparation either. At last, everything was prepared, and we were able to taste the fruits of our labor. While we weren’t able to take a trip to New Orleans, we enjoyed a lot of the foods so beloved from that city. 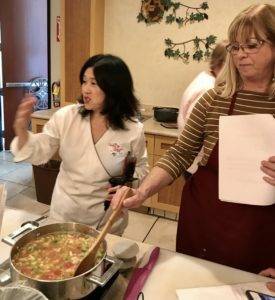 If you want to plan any kind of cooking adventure, wine making event, or to learn about upcoming classes, you can contact MJ Hong through her website at http://www.thewineartist.com/. 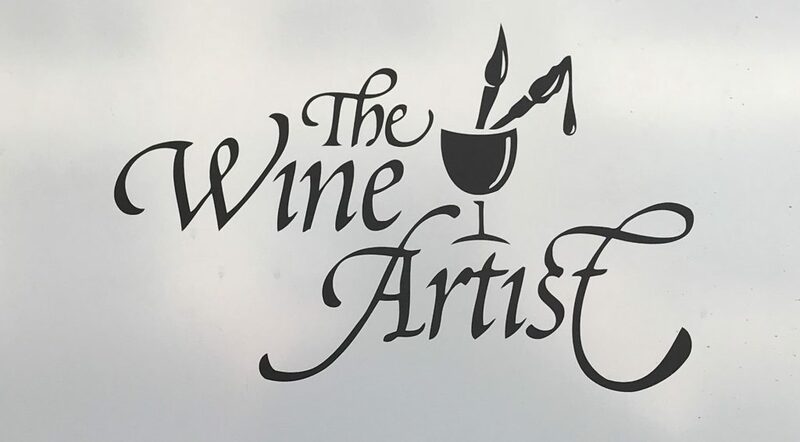 The Wine Artist is located at 21064 Bake Parkway, Ste 100 (Bake Pkwy & Cape May), Lake Forest, CA 92630. In a large bowl, add warm water, yeast, and sugar. Stir to combine and let sit for 5-10 minutes. In a measuring cup, add milk. Add in egg and salt; whisk with a fork. Add to yeast mixture and stir to combine. Add 2 cups of flour and mix with a wooden spoon. Add in shortening or butter and continue to mix. Add in the remaining 1 ½ cups of flour and stir until combined. Place dough on a floured work surface and knead until smooth. You’re appealing to my Cajun soul! Merci for the share! 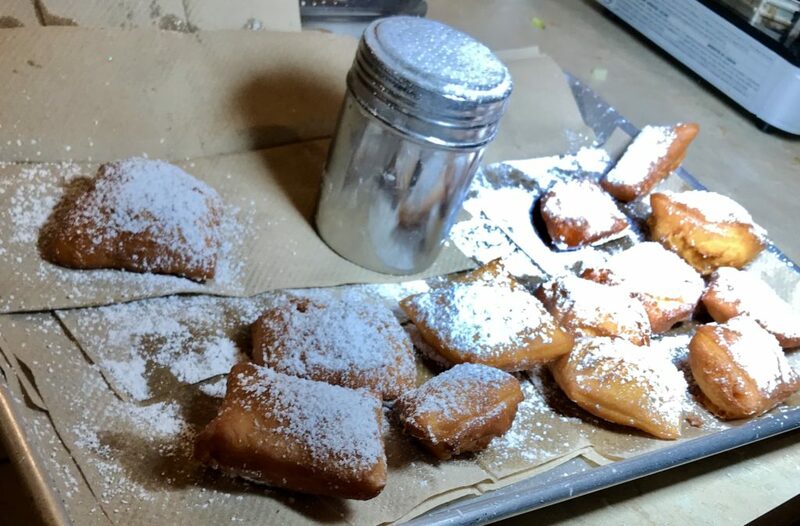 That photo of the beignets always makes me hungry. Paula, the beignet photo makes me hungry, too. Try this beignet recipe. They are not difficult to make but are a wonderful treat.